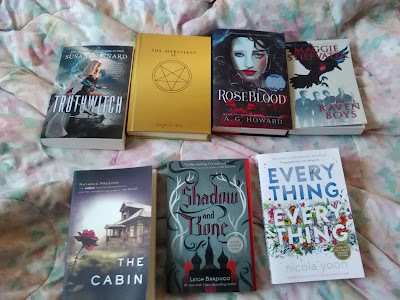 Semi-Professional Book Person: SPRING BREAK BOOK HAUL! So as some of you may know, I grew up in Ohio, and my father still lives there. So during vacations, I go up to visit him -- in fact, I just got back last night from visiting with him over spring break. And as some of you may know, the only Barnes and Noble in the town where I live currently just closed. Meaning that this visit, I saw the inside of a Barnes and Noble for the first time in four months. And I had just gotten paid. Yeah, I went a little hog-wild. Time to go over the books I bought, and had significant difficulty fitting into my luggage when it was time to go home! 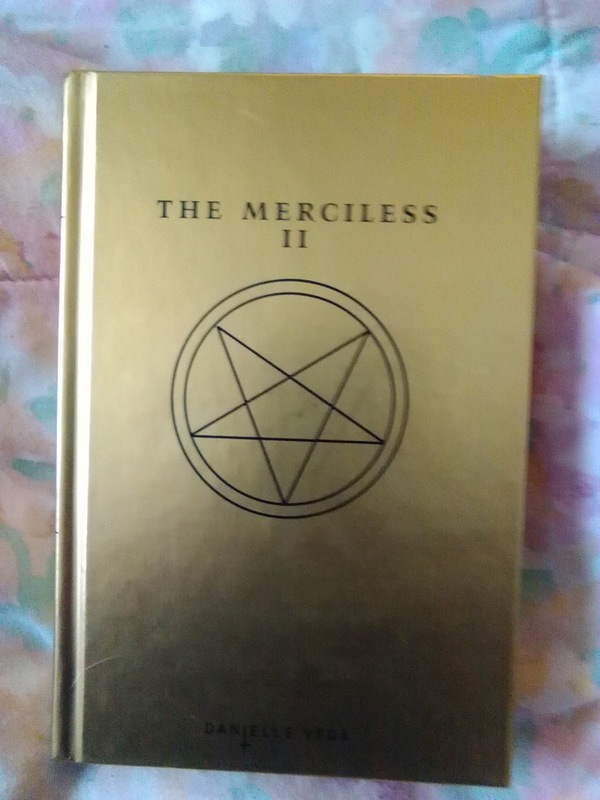 The first book I'm going to talk about is The Merciless II: The Exorcism of Sofia Flores by Danielle Vega. I actually read all of this book during my vacation, so you can expect to see a full review of it soon. It is a direct sequel to "The Merciless," which I've already read and reviewed. (You can find that post here.) It follows our main character Sofia in the aftermath of the first book, which resulted in a lot of bloodshed and a lot of PTSD. Sofia is sent to a strict Catholic boarding school in hopes of starting over, but bad luck follows her wherever she goes, and soon, it's a threat to any chance Sofia has at a normal life. I was really excited to read this book, as I adored "The Merciless." 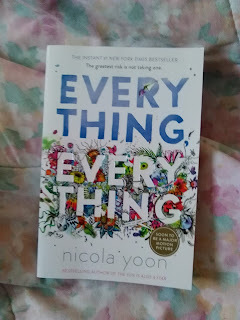 While I ultimately didn't enjoy it as much as the first book (I'll elaborate in my review), I think it's a worthy successor to it, and I'm looking forward to the third book, which is slated to come out this summer. Next up is Everything, Everything by Nicola Yoon. This is a highly praised contemporary YA romance that's getting made into a movie starring Amandla Stenberg. I love Amandla, so I'm eager to read this before the movie is released. It follows Maddy, a teenage girl who, thanks to a rare disease, is literally allergic to the outside world, and has not left her house in eighteen years. She has never met anyone aside from her mother and her nurse, until a family moves in next door, and their son, Olly, begins texting and emailing with Maddy. I've heard wonderful things about this book's story and writing, and the trailer for the movie looks like it'll be good, so I'm eager to pick it up sometime soon. 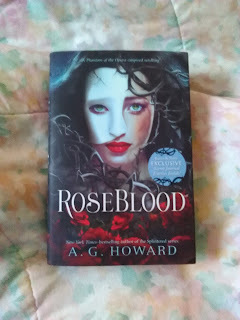 Next on my list is RoseBlood by A.G. Howard. I'm going to be honest with you: I know virtually nothing about this book's plot, except for the fact that it's a retelling of "Phantom of the Opera." But I am such Phantom trash that I bought it the second I had the chance. 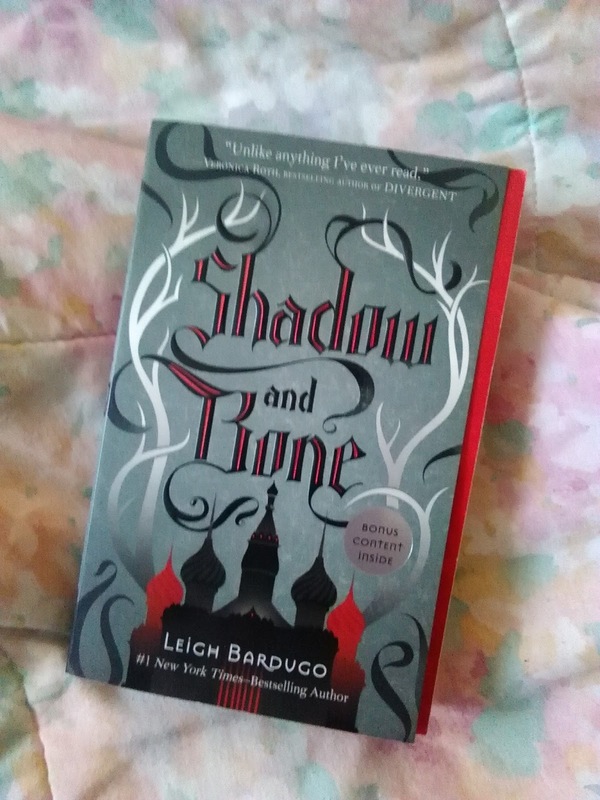 I've heard mixed reviews of this book, but, honestly, I love the Phantom story so much that even if it's bad, I'll probably enjoy it, at least a little. This is a book I already mentioned wanting to read on this Top 5 Wednesday entry. Truthwitch by Susan Dennard is the first book in the Witchlands series, which I've heard hyped up a lot on booktube and other bookish communities online. 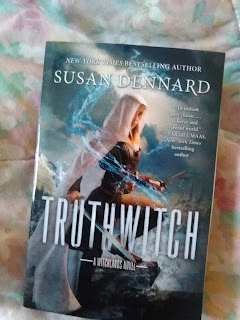 It's set in a world of many, many types of witches, and the main character Safi is a Truthwitch, a rare type of witch that can always tell a lie from the truth. She and her best friend have to use their powers to stop a war from breaking out, but Safi is in great danger because many people would do anything to use her abilities for their own gain. I've heard great things about this series, and it sounds like such a unique and intriguing idea, that I'm excited to get started on it. Another book that I mentioned during Top 5 Wednesday! Shadow and Bone by Leigh Bardugo is the first book in the Grisha Trilogy. Set in a world where magic is rare, the main character Alina discovers that she has magic, surprising everyone, including herself. Alina's dormant but powerful abilities may be the key to ending a war, so she's whisked away from everything she's known to become a member of the Grisha, the magical elite forces. These books were ones I always saw in the bookstore, admired the covers for a minute, before putting them back down, but I've heard a lot of great things from almost everyone who's read them, so I've decided to finally get started on them! Next up is The Raven Boys by Maggie Stiefvater. This is the first book in the Raven Cycle, a series following Blue, a girl who has been warned since childhood that she would cause her true love to die. Her clairvoyant mother can see and speak to the soon-to-be-dead, but Blue has never been able to see them -- until this year, when one of them speaks to her. 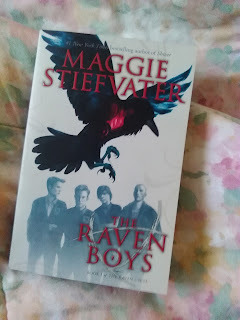 I admit I put off reading this series because I've also read the Wolves of Mercy Falls series by Stiefvater, and I wasn't too impressed with them. But even people who don't like those books seem to like these, and from what I've seen on Tumblr, these books have a wide appeal. And hey, they're getting made into a TV series soon -- so why not give it a shot? 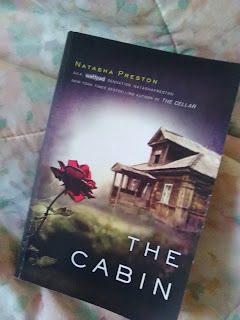 Last on my list is The Cabin by Natasha Preston. It is a murder mystery, focusing on a girl named Mackenzie as she goes out for a weekend of partying with her friends at a remote cabin, when two of them wind up dead. It soon becomes evident that only someone at the cabin could've done it, and so Mackenzie and the other survivors are forced to suspect each other, as everyone's a suspect -- and the killing isn't over. I'll admit this doesn't sound like the most original plot in the world, but I do love a good whodunnit, and it seems like a good book for when I need something quick and fun. So those are the seven books I bought over spring break! I can't wait to tackle them... and I hope you all will enjoy hearing me talk about them on this blog later on! Thank you so much for reading! If you like my content and would like to see more, please consider subscribing to this blog. And, if you have a few dollars to spare every month, consider becoming one of my Patrons! Patrons get access to exclusive content, and also get to vote on what books I read and review. Even one dollar a month can make a huge difference. My Patreon page is HERE. Thank you!